At a Parish Council meeting held on May 15th 1895 Mr. Staples moved "That the Chairman wait upon the guardians with reference to their sending so many of their dead to Rothley the churchyard being very full and it being expected that in a very short time a cemetery will have to be provided if interments are continued at the present rate." It did, however, take nine years from this date until the Cemetery was consecrated. 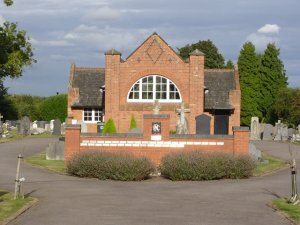 In July 1904 a notice was placed in the Rothley Post Office window stating that "the cemetery is complete and interments can now take place". The acquisition of the land, raising of finance, objections and the building of the Chapel became a major project for the Rothley Parish Council 100 years ago and their efforts are recorded here with extracts from the Rothley Parish Council Minute Book 1895-1908. This page is dedicated to the members of the Rothley Parish Council who served the village between 1895 and 1904, they did a tremendous amount of work over the years and would be very pleased if they could see it now. XHTML 1.0 validated. WCAG compliant. Page generated in 0.1768 seconds.